On September 14, 2018, Hurricane Florence made landfall on the North Carolina coast before idling in place for days. As it moved westward across the state at only 2-3 MPH, the sluggish storm saturated the Carolinas with an average 17.5” of rainfall—and close to 36” in some areas. Even in the aftermath of Florence, steady and heavy rainfall continued to batter the region through the fall and into the winter of 2019. To get a more detailed look at the actual data, I used the precipitation tool in SilvaStat360 to analyze rainfall trends in the region. By the end of 2018, rainfall totals were 40% higher than the 10-year average in the Carolinas, and they eclipsed the totals of 2015—the previous high point in the 10-year period—by nearly 8”. Most of this precipitation accumulated during the second half of the year. As expected, this steady deluge of water had direct impacts on the region’s forest products supply chain, particularly in the stumpage market. Much of the timberland in the Carolinas simply became unworkable or was underwater—“good ground” became an extremely rare commodity, and stumpage markets reacted accordingly. 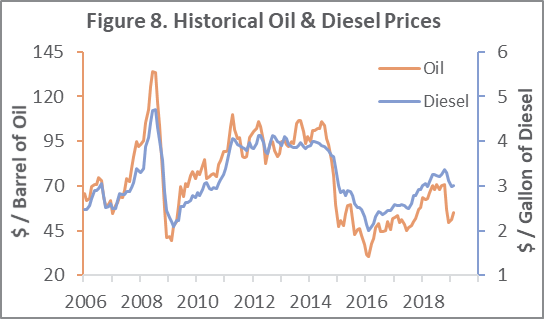 From September – December 2018, stumpage prices experienced an increase of 5.5% for all products across the board in the Carolinas. However, some interesting dynamics began to take shape in the pulpwood market during this period. While there were several individual sales at higher-than-normal prices—a sign of low supply/high demand in certain areas—the overall weighted average prices remained pretty consistent through October: ~6% for hardwood pulpwood and ~2% for pine pulpwood. But as dry ground became scarce and the rainfall continued, prices began to ratchet higher in response. 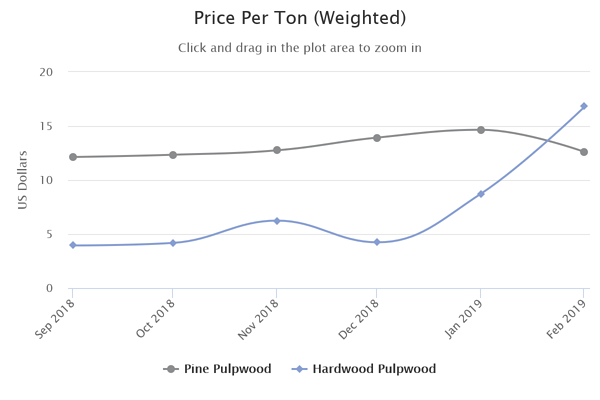 Pine pulpwood, which flourishes in the upland soils of the Carolinas, increased by 21% in price by the end of the year. As logging crews flocked to harvest this product on dry ground in upland stands, the lack of logging that took place in the wet bottomlands created a shortage of available hardwood pulpwood on the market, and demand caused regional prices to spike. As any forester will attest, we’ve all gotten that phone call at the end of working a pine tract asking, “Where are these couple loads of hardwood going”? It’s an extremely important forest product and its supply is typically steady enough to keep up with demand. However, finding a home for a couple loads of hardwood hasn’t been an issue since the end of 2018; the supply and demand curve for hardwood has changed drastically. As wet conditions persisted through the end of the year, production numbers continued to flounder and a majority of hardwood tracts were simply inoperable. Supply withered and prices nearly quadrupled during the first two months of 2019 as a result. As the Carolinas continue to struggle with excessively wet weather in the wake of Hurricane Florence, it will take some time for the markets to reach a point of equilibrium that is driven by steady timberland accessibility. However, markets are often reactionary in the short term and the huge spike in hardwood demand has shifted some of the focus from pine. The regional forest industry is now asking the obvious question: Will the demand for hardwood continue, possibly creating a shortage of pine harvests that will in turn send those prices skyrocketing, or will the markets level out? By mid-summer, I think we will see things begin to settle. When a natural disaster strikes a specific region, the local timber markets typically fluctuate in several stages that affect price in both the short and long terms. Examining historical stumpage data via Forest2Market’s Stumpage360 tool allows participants in the southern timber supply chain to see exactly what’s happening in their local markets. 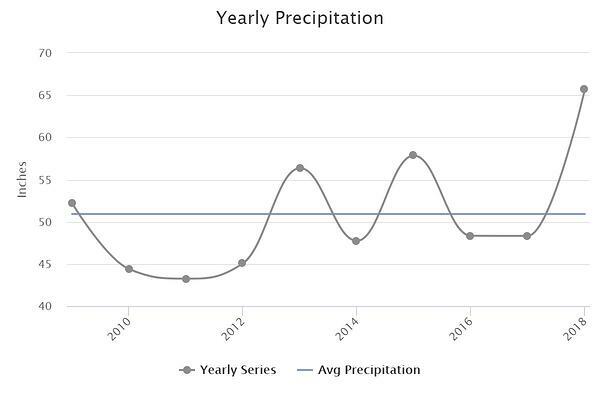 This level of insight provides a unique look into market reactions and can help members of the forest value chain recognize trends, prepare for weather-related interruptions and capitalize on future market fluctuations.